You’d have to ask Jes what it’s like to meet us en masse for the first time. I can only imagine that it’s mildly terrifying. Strictly speaking on an individual basis we’re not particularly scary. But, we’ve all known each other for at least 10 years and we’ve been having dinner together once a week for most of that time. We don’t always communicate in full sentences anymore. A lot of the time we short hand ideas via various British comics – Eddie Izzard, the folks at Beyond the Fringe, the occasional influx of Yes, Prime Minister, although that’s mostly just me. We have multiple in jokes about homunculi (because well, once you have one they seem to multiply – the jokes, not the homunculi). We’ve had perfectly serious conversations about the composition and history of blood mead that sounded for all the world like we were contemplating serving it at our next party. Rest assured, to the best of my knowledge none of us has ever served anyone blood mead for any occasion. And, while having an opinion about which captain was the best captain isn’t a requirement, having the answer not be Janeway probably is*. This is to say that a friend brought her beau to Dinner this week – friend and beau were the reason Dinner got moved to Friday because they couldn’t make it up to Boston for dinner on Wednesday but still wanted to see all of us. Well she did, it’s possible the Boy was feeling a little more cautious about the idea. Still Jes survived introduction to Dinner many years ago, and a couple of years after that we gave a stamp of approval to her boy who also survived admirably. Also, he seriously espoused the idea that he’d detracted from her cool factor which made all of us laugh hysterically because none of us has ever been cool. This beau also passed with flying colors. He definitely knew that Janeway was not the correct answer. Upon inquiry Jes reveals that she wasn’t nervous coming to Dinner the first time, she was nervous about coming the second time. Not because we were Dinner, but because we sat down and ate around a table and discussed things! She was expected to know things. This should reassure my father who worries that I don’t have enough esoteric conversations on a regular basis. * Said with love, irony and a completely straight face at dinner last night. ** For those who didn’t get it, it’s a gratuitous Star Trek reference. General note about Dinner this week: There were 12 RSVPs for Dinner (granted one was from a 2 year old, but still), one of whom is a vegetarian. The quantities of food that you need, and the quantities of food that will disappear when you feed 12 people are slightly mind boggling. It isn’t a question of making half again as much food to feed an extra four people, it’s more like doubling everything and then some. From the amount of food on the table you would have thought I was feeding the invading Russian army, and while there were leftovers to send home with people there wasn’t as much as you’d expect. There was extra pie, which we ate for breakfast as is only right and proper. There’s the verb to barbeque which involves throwing things on a grill and cooking them until they’re done. And, then there’s the noun barbeque which is closer to a religion in certain parts of the country than it is to a method of cooking. To be scrupulously honest this is not a substitute for authentic slow cooked barbeque which tastes and smells like something close to heaven. However, in the absence of a smoker, or even a wood burning grill, this is a decent simulacrum. You can make this with pork or chicken. I’ve done it with both, but this week was a birthday dinner week and the request was specifically for pulled chicken so that’s what I made. It should be served on white hamburger buns, or white bread. I must be most firm on this point. This is not the time to break out the organic, homemade, whole wheat bread. 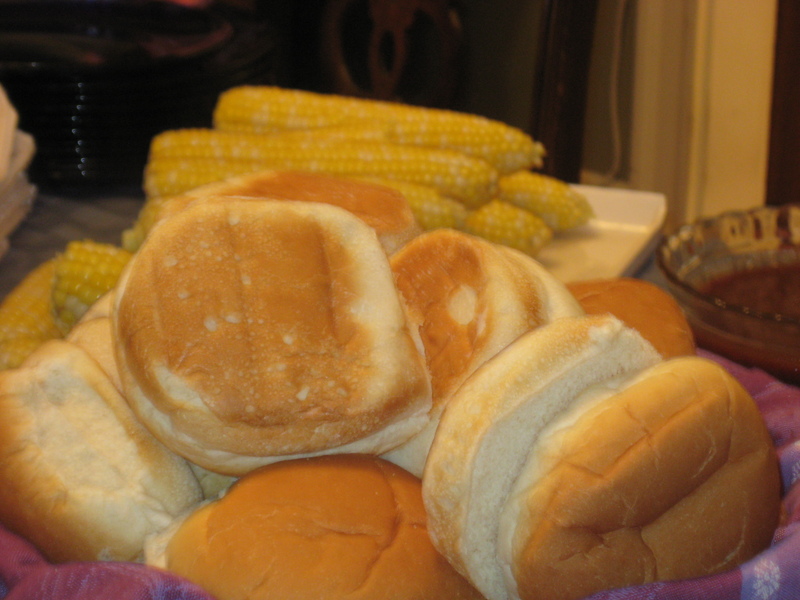 Good, old fashioned hamburger buns are what you want to use. You can eat your cole slaw on the side, or piled on the sandwich with the meat. You can add extra sauce or not, and you can make the sauce as spicy as you like and even add a dash of Tabasco on top if you like. I like my pulled pork sandwiches with coleslaw and extra sauce, but hold the Tabasco. Sprinkle the dry rub over the meat and rub it in slightly. 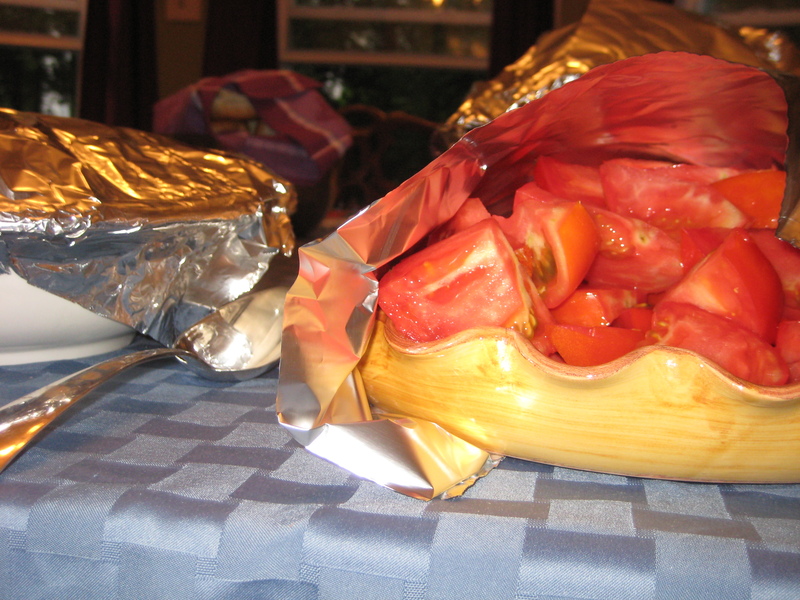 Place on a baking sheet and cover tightly with tin foil. Roast until done. Allow to cool slightly and then pull the meat apart with your hands/fork (it’s easier with your hands). Because you’ve covered it with foil you’re basically cooking the meat in its own steam which keeps it nice and juicy. It also means that you’ll be end up with a lot spicy chicken broth from the liquid that cooks out of the meat. Do not throw this away. This is seriously delicious. 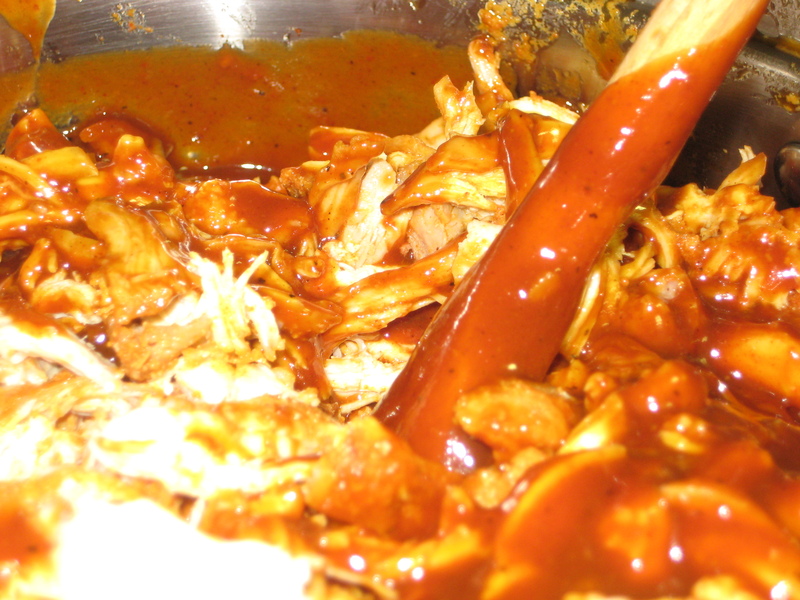 Use some of it to moisten the pulled meat before you mix in the barbeque sauce. Place all ingredients in a pan and whisk to combine. Cook it for about 15-20 minutes to allow the sugars to melt and the sauce to thicken slightly. Adjust vinegar/molasses/ketchup levels to taste. When you first mix this together it will taste like you could use it to strip paint. Don’t worry. Cook it down some and then taste again. If you still think you could use it to strip paint add some more ketchup and molasses. If you like paint stripping in a barbeque sauce add a little more vinegar or mustard to the mix. If you’re not really into spicy you might want to go easy on the cayenne. You also want to bear in mind that you’re not going to be eating this straight from the pot, you’re going to mix it with a lot of meat and that will dilute the spiciness a lot. Mix most of the sauce with the pulled meat. Reserve some sauce to serve at the table. You can make this in advance and reheat it in a pan on the stove. I usually add a little more sauce as it reheats it so the meat doesn’t stick to the pan and/or dry out. * One final thing to bear in mind, I usually figure on about half a chicken breast per person (which is roughly 1/3 lb) but when you make barbeque you have to up that estimate. I don’t know if it’s because it’s good, if it’s because it’s piled on a sandwich, or what the reason is, but people eat far more barbeque than they would if the meat was in it’s original configuration. 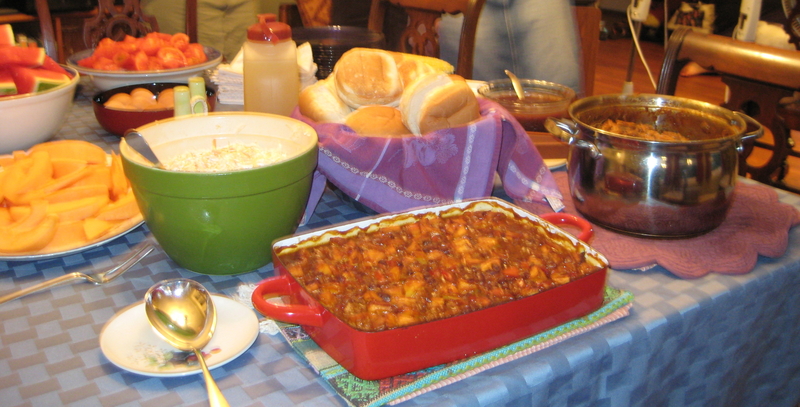 Have you ever tried to make southern food vegetarian? Everything starts with bacon. A friend’s husband came to Dinner this week and while technically he’s kosher not vegetarian, it’s effectively the same thing when he eats out. I was searching for something else to serve so that he’d have enough protein to eat despite a meal that was based around a meat dish. Friends who had barbeque at their wedding (incidentally, best wedding food I’ve ever had) solved this issue by serving macaroni and cheese, but honestly my week got a little crazy and I just didn’t have time to make macaroni & cheese. So, I compromised with baked beans (omitting bacon and adding garlic) and hardboiled eggs. This is one of my 10 desserts. It’s easy. It’s elegant. 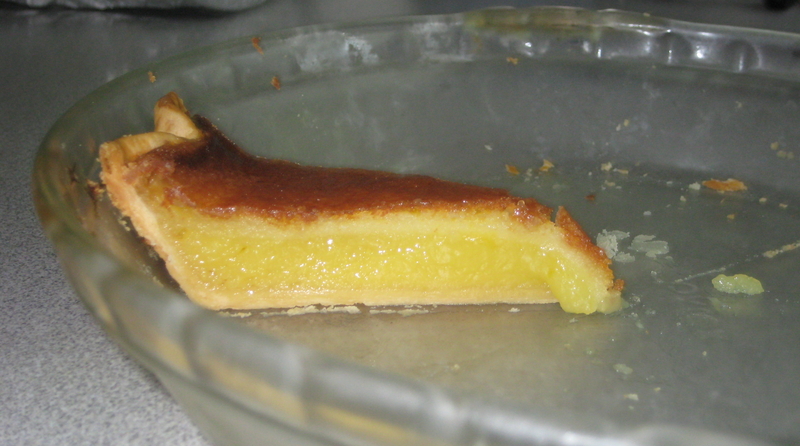 It tastes like the inside of a lemon bar. And somehow people always think you put a lot more effort into it than you actually did, which in my book is pretty much the definition of a perfect dessert. Cream together the butter and sugar. Add the eggs one at a time, mixing thoroughly in between each addition. Add the lemon juice and zest. Beat to combine. Pour into a 9” pie shell and bake for 35-40 minutes at 325. Allow to cool and then refrigerate for several hours, or overnight. When you add the lemon juice your batter will look like it’s curdling. Don’t worry. It’s just the acid in the lemon juice breaking the eggs a little. It always looks like that and it’ll bake up fine. Although, if you wanted to make the batter in advance I’d do it up to the point where you add the lemon juice and only add that right before you’re planning on baking the pies. I baked the chicken before I put the pies in and I think my oven was still a little too hot when I baked them so they browned more than they’re supposed to. The pies were still good, some of the sugar essentially caramelized on the top of the pie, but they weren’t quite as pretty as I’d wanted. I too stress that barbecue must always be eaten with some form of white bread if the bread is to be used as a vehicle for sauce. This is one time Wonder Bread may be purchased guilt-free. There are people who would say that corn bread is acceptable. 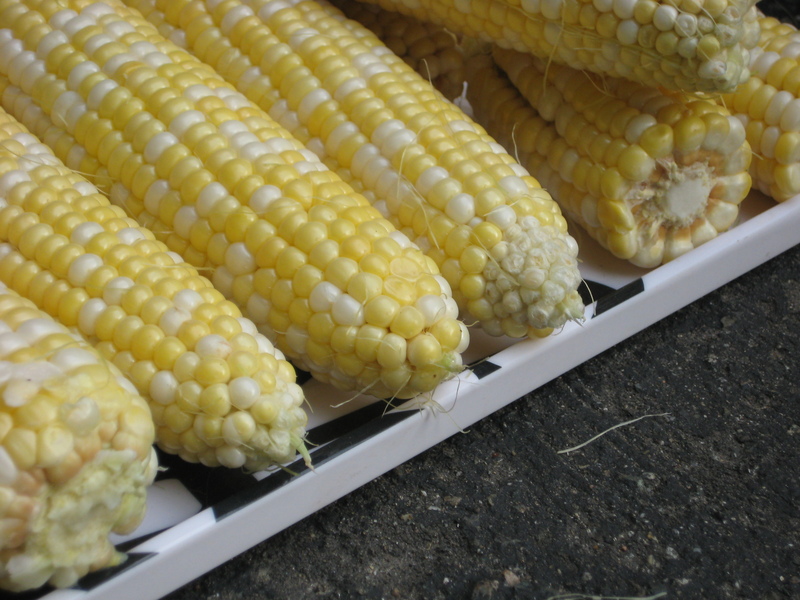 This is true; corn bread may be eaten with barbecue, but should be looked upon as a side dish. Corn bread does not a sauce vehicle make. Too crumbly. Oh, and I’m assuming you’re slow roasting the chicken/pork. Are you setting the oven to 250? For 3-ish hours? I slow roast the pork like that, the chicken I actually usually do at 350 until a meat thermometer reads 180. Also, yes absolutely about the corn bread. 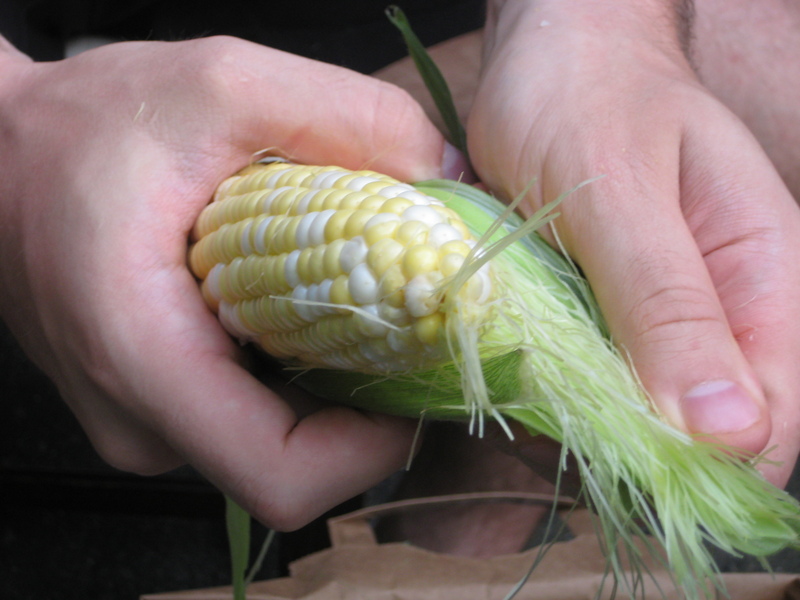 Corn bread is a side dish, not a sandwich maker.